Hill Street Reports FQ1 2019 Revenue Up 112% & Provides Update on Operations – Hill Street Beverage Company Inc.
Toronto, Ontario–(Newsfile Corp. – November 30, 2018) – Hill Street Beverage Company Inc. (TSXV: BEER) (“Hill Street” or the “Company“) reported its fiscal Q1 2019 financial results for the three-month period ended September 30, 2018. A complete set of financial statements and Management’s Discussion & Analysis has been filed at www.sedar.com. All dollar figures are quoted in Canadian dollars. Net loss of $10 million for the quarter, including one-time, non-cash expenses for the reverse takeover transaction (RTO) of $8.9 million, and one-time cash expenses of $305,000. 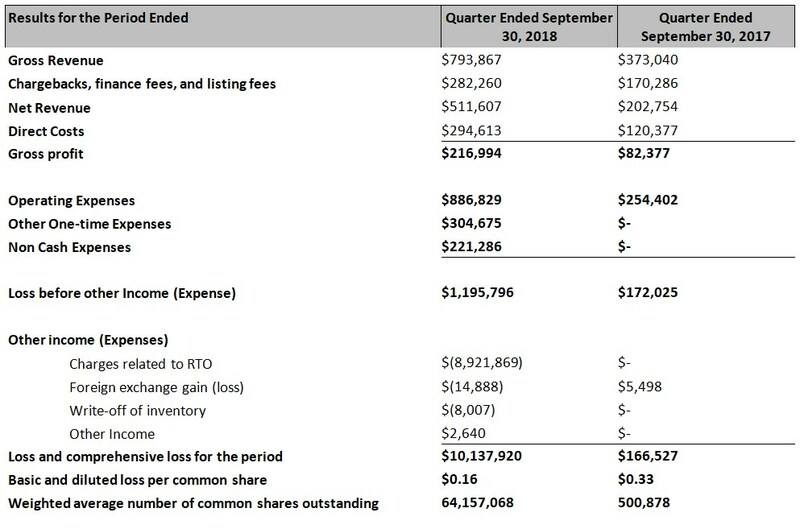 This compares to FQ1 2018 when the Company had a net loss of $167,000. End of quarter cash position of $3.1 million, with no debt. The Company presently has one business segment, the marketing and distribution of alcohol-free beer and wine in Canada and, to a much lesser extent, the United States. Hill Street sells its products online and in approximately 4,000 recognized retail chain stores through licensed distributors in Canada. Subsequent to the end of the quarter, the Company also announced significant new distribution and retail listings, giving it an addressable retail market of nearly 7,000 stores, with significant new coverage of the independent retail channel across Canada via National Importers, and the dépanneur retail segment in Quebec via Clark, Drouin, Lefebvre. It also provides a direct consumer subscription service at www.hillstreetbevco.com. According to a leading beverage industry market research firm1, the non-alcoholic wine and beer market consistently ranks as one of the fastest growing sectors in the global beverage industry and is expected to generate 8.5% CAGR globally until 2025. In Canada, the segment has experienced annual growth in excess of 20% a year for the past few years, which has seen the launch of new alcohol-free beer brands from the top brewers in the world, in addition to new craft beer offerings from regional and local brewers. Hill Street has acquired a significant part of this growth, leveraging our relationship with major national retailers to expand our presence on shelf, as well as securing the opportunity to produce private label versions of our products for major retailers such as President’s Choice De-Alcoholized Wine. According to Statistics Canada, there are approximately 20 million consumers who drink alcohol. Per capita, the Canadian consumer drank approximately 255 (371 ml size) bottles per capita in 2015, implying that more than 5 billion bottles of beer were consumed during that year. The annual decline of beer consumption in Canada is 0.7%, as consumers trend to moderation and look for alternatives to alcohol given its negative impact on their health and lifestyle. According to recent research released by Deloitte, approximately 30% of the Canadian population is interested in trying cannabis edibles, including beverages. If they all chose to switch to cannabis-infused beer, the size of the beer market alone would be 1.6 billion bottles, or almost 66 million standard cases of 24 bottles of cannabis-infused beer per year. At an average wholesale price of $36 per case, $2.36 billion in market potential. Since regulations prohibit the mixing of alcohol and cannabis in a commercial product, a beverage must contain no alcohol if cannabis is to be added to it, and the removal of alcohol from traditional beer and wine changes the flavour profile of the beverage. For this reason, any producer of traditional alcoholic beer or wine wishing to create a cannabis-infused version of its products would first have to produce great tasting alcohol-free versions of their brands that consumers would enjoy. Having already solved this problem, Hill Street is proceeding on to the next stage-infusing its beverages with cannabis. Management signed a license agreement with Lexaria Bioscience during the quarter, providing the Company with access to technology to render cannabis into an odorless and tasteless water-soluble powder which can then be added to its alcohol-free beverages. Hill Street believes that the cannabis-infused beverage segment can best be described as three distinct beverage categories: 1) “Heighten” (adult recreational use); 2) “Help” (therapeutic or functional beverages); and 3) “Heal” (medicinal or prescription beverages). We intend to market beverages for the adult use and therapeutic or functional beverage categories, and to explore co-packing partnerships with major licensed producers to address the prescription drug or medicinal segment. Hill Street intends to meet this potential demand with the same type of high quality and award-winning products we have produced for the alcohol-free category, and with the same level of focus on brand development, sales and distribution.